A state located on the southeastern side of the Indian peninsula, Tamil Nadu's cultural history spans more than 2,000 years, with a distinct heritage shaped by the region's majority Dravidian population. It is a territory of varied topography, including more than 600 miles of coastline; it's filled with thousands of dazzling Hindu temples and it is where Tamil, one of the oldest written languages in India, originated. For a period of over 1,500 years, starting from the fourth century BCE, Tamil Nadu was dominated by three major dynasties—the Cheras, Pandyas, and Cholas. 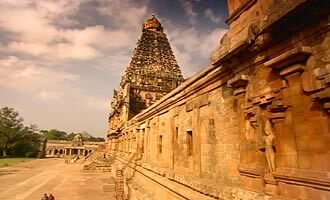 Beginning in the Common Era (0 CE), Tamil Nadu became a hub of Indo-Roman trade, precious stones, and gold. Among the state's most prominent cities is Madurai, the onetime capital of the Pandya dynasty and home to the Meenakshi-Sundaresvara Temple, with its 12 gopuras. 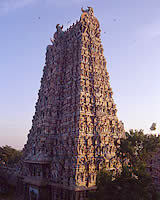 Other major cities include Tanjore (Thanjavur), the onetime capital of the Cholan Empire, which reached its height during the reign of the king Rajaraja (985–1014 CE); and Madras, the state's present capital, now called Chennai, which was established in 1639 by the British East India Company. Tamil Nadu is the most urbanized state in India, but agriculture remains a vital part of the economy, especially rice cultivation. 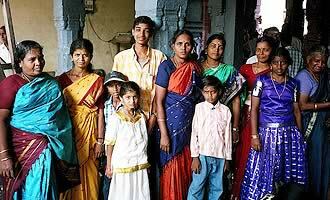 An official language of India belonging to the Dravidian family, Tamil is not related to the Indo-Aryan family of languages. Tamil, spoken by more than 60 million people, is the official language of the Indian state of Tamil Nadu and an official language of Sri Lanka. Malaysia, Singapore, and certain African nations that have sizeable Tamil-speaking populations. One of Ashoka the Great's edicts identifies his southern neighbors as the Cholas and Pandyas, both Tamil-speaking peoples. Tamil literature is over 2,000 years old, and Tamil poetry and grammar reveal much about southern India around the time of Christ. Tamil poetry recited by both men and women at marathon arts festivals, called sangam, describes a caste society and extensive foreign trade with the Roman Empire that extended into southern India from Egypt, which had come under Roman rule in 30 BCE. Dialects within Tamil are numerous, and the language is characterized by a sharp division between a literary or classical style and a colloquial variant. Of the 12 gopuras (towers) that are part of the temple complex, the tallest are the main entry points located at the four cardinal directions. Each pyramidal tower has nine stories and ranges in height from 160 to 171 feet. The towers, constructed on granite bases, are made of brick and stucco, and their exteriors are covered in a profusion of elaborate, stucco sculptures of gods, demi-gods, and mythical animals and monsters. Originally monochrome, these figures were painted in bright colors, greens, blues, yellows, and reds, in the 20th century and are refurbished and repainted every 12 years. Located in India's southern state of Tamil Nadu, Tanjore sits on the Cavery River delta and was a capital of the Cholan Empire that reached its height between the 11th and 13th centuries. Tanjore's proximity to the Kaveri River, extensive irrigation system, and rich soil make it an important agricultural region and producer of rice, coconut, mango, and plantains. The Cholans were patrons of a magnificent revival of Indian art, sculptures, bronze casting and architecture. Under their successors a renowned style of Tanjore painting developed, which incorporated rich colors, decorative stones, and gold leaf into displays of Hindu spiritual and mythological themes. In 1010 CE, a magnificent monument to King Rajaraja of the Cholan Empire and his personal god Shiva was completed in Tanjore. The Rajarajeshvara or Brihadishvara temple was the tallest building in India at the time with a massive ceremonial space, moat, and a central shrine reaching a height of 216 feet. Tributes sent from throughout Rajaraja's empire supported the vast retinue of dancers, servants, singers, carpenters, goldsmiths, and others who made up the temple's staff. Temple inscriptions document both transactions related to Brihadishvara, and also Rajaraja's conquests, and provide extensive information about the medieval Cholan Empire. Madras, renamed Chennai in 1997, is the capital of India's Tamil Nadu state and located on the shore of the Bay of Bengal. The fourth largest city in India with a population of over 7 million people (in 2007), Chennai is a center for business, education, and transportation. Although the origin of the town's name is unclear (both Chennaipaatinan and Madraspatnam may have been names of local villages), Madras's name change reflects a growing practice in India to privilege local, not colonial, place names. The city's architecture reflects a mix of styles, and notable buildings include its seven ancient Dravidian temples and Indo-Saracenic structures such as the Chennai Central Railway Station and the Victoria Technical Institute, designed by the British in the 19th and 20th centuries. In 1639, the British East India Company purchased the future site of Madras from the Raja of Chandragiri. The settlement was one of the Company's first military and trading centers in India and became its headquarters by 1800. The center of the Company's city was Fort St. George, built in 1644, a citadel named after Britain's patron saint. The city that grew around the fort's periphery originally contained settlements of British officials and traders as well as local cotton weavers and merchants. The French East India Company's base at Pondicherry was less than 100 miles south of Madras, and the two rivals vied for power in the region. Conflict broke out when each company tried to ally with princes in Arcot and Hyderabad. 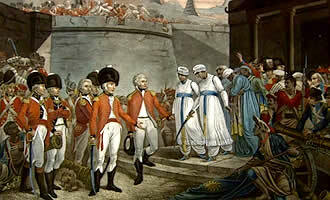 The French seized Madras in 1746 but the city was transferred back to the British in 1749. Industrial and railroad expansion in the 19th century established Madras as an important commercial and administrative center. 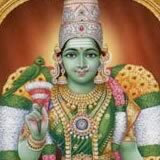 Meenakshi is a Hindu goddess particular to South India, who, according to legend, emerged from a sacrificial fire as a young girl in answer to the prayers of the childless Hindu Pandya king of Madurai, Malayadvaja. The king adopted the girl—who was named Meenakshi for her fish-shaped eyes—but was concerned that she had three breasts. A divine voice told him that Meenakshi’s extra breast would disappear after she met her rightful consort. Meenakshi grew up to become a fierce warrior and, during a skirmish against Shiva's armies at Mount Kailash, the god's Himalayan home, she saw him on the battlefield and immediately lost her third breast. Meenakshi recognized Shiva as her divine consort, as she was the incarnation of his wife, Parvati, and they were married. 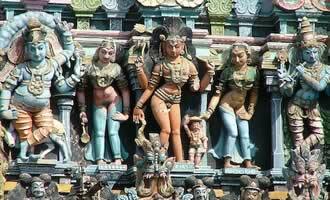 Together they ruled the Pandya kingdom and also became the presiding deities of Madurai's Meenakshi-Sundaresvara Temple. 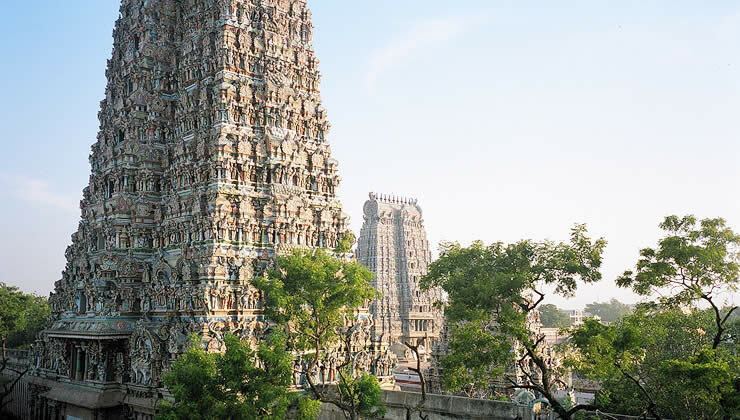 Today Madurai is one of the most bustling cities in Southern India, with two million people; but Meenakshi is still regarded as the city's patroness, rather as Athena was in classical Athens. Shiva, known as the destroyer, is the third of the principal gods of the Hindu. The triad's two other gods are Brahma, the creator of the universe, and Vishnu, the preserver of the universe. Hindus believe that Shiva periodically destroys the world in order to recreate it and is the source of both good and evil. Shiva is depicted in many forms and known by 1,008 names, which are detailed in the Shiva Purana. He is often presented with a blue face and throat; long, dark matted hair; and holds a trident, which corresponds to the functions of the Hindu triumvirate. His forehead is anointed with three horizontal lines in white ash and may also feature a third eye, a symbol of wisdom and untamed energy. Among the most ancient representations of Shiva is as a lingum, a phallic statue that symbolizes his progenitive powers, and as a yogi, seated cross-legged in meditation dressed in a loincloth or simple animal skin. Figures of a dancing shaman/deity with trident bangles and an animal headdress has been found on prehistoric wall paintings in Central India and though this is disputed, many scholars see a proto-Shiva as depicted on seals from the Indus Valley civilization. When depicted in the pose of the cosmic dancer, Nataraja (or Lord of the Dance), Shiva's dual nature is manifest in a single image, for his dance is believed to both destroy and restore the universe. He is also the ideal family man and husband when shown with his wife, the goddess Parvati, and his two sons, Ganesha and Skanda. 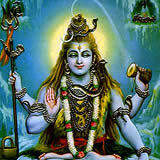 Many Hindus worship Shiva as the supreme and all-powerful deity and are part of the Shaivism sect. As a mark of their devotion, Shaivite ascetics smear their bodies with ash, keep their hair uncut, and carry a trident. Why did the British find the region so valuable? What did the Romans trade with Tamil Nadu?